It’s that time of year, when little bunnies and the occasional chipmunk start scampering through my back yard. The grass is green again (when did that happen?) and trees are sprouting fresh green leaves. The light always changes on me around now, so please pardon the harsh shadows and highlights for a while. They make the photography process more challenging, in a way that’s both fun and trying. Yesterday afternoon, after stressing over the cookbook all morning, I stepped outside and realized I was missing the most glorious seventy-two degree afternoon. I still had tons of work to do, though, like this blog post. My fridge was (is) ironically empty, but my freezer is well-stocked with delicious frozen berries sent from Cascadian Farm for an upcoming project. And I have tequila, always. I decided to slow down and make some frozen strawberry margaritas to commemorate spring. They were just delightful: refreshing, not too sweet, boozy but full of ripe strawberry and fresh citrus flavor. Hope you’ll slow down and sip one soon! 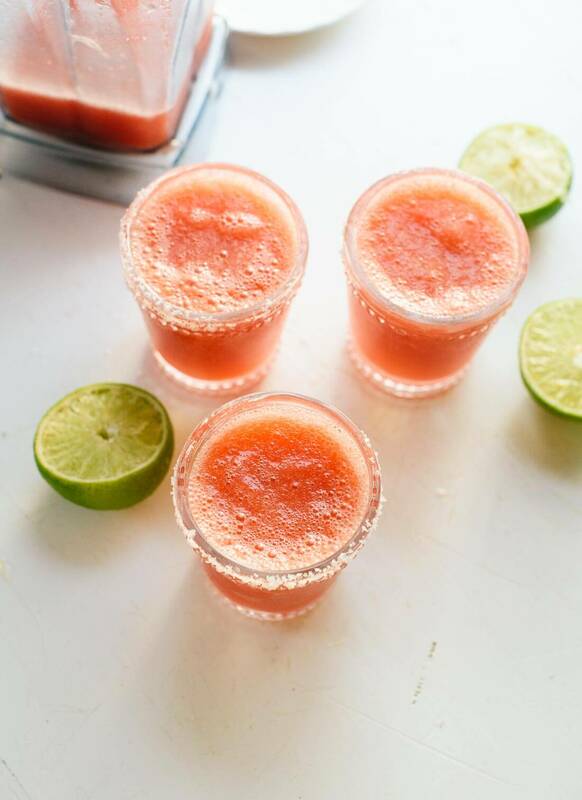 If you’re not feeling strawberry, check out my other margaritas here. 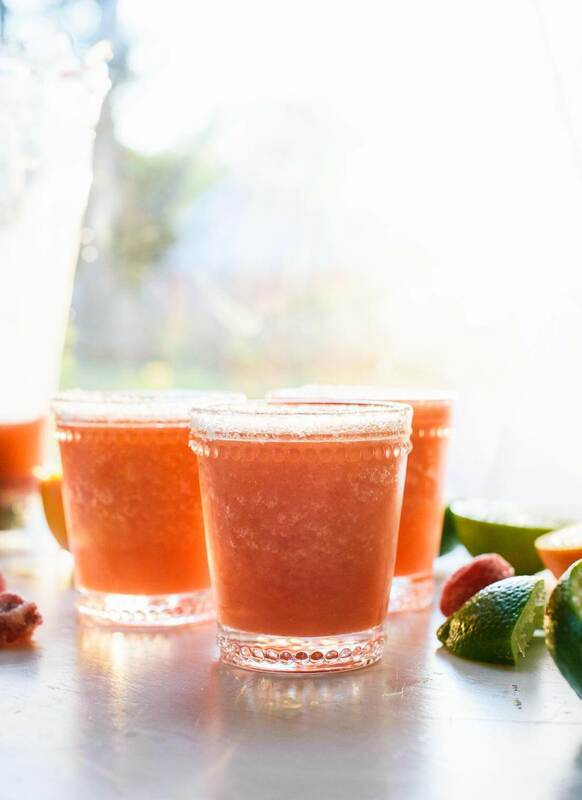 Frozen strawberry margaritas are so refreshing! 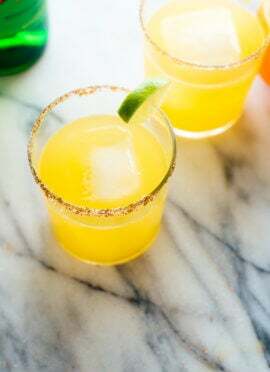 This margarita recipe is made with all-natural ingredients, and it’s ready in under 10 minutes. Recipe as written below yields 1 cocktail, so multiply as necessary. Just don’t fill the blender past the maximum fill line (trust me!). First, prepare your glass(es): Pour the salt onto a very small plate. 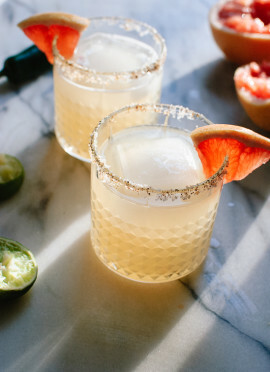 Run a small wedge of lime around the upper outer rim of your glasses (I usually only salt half of the rim, so I can control how much salt I get in each sip). Roll the dampened rim into the salt mixture. Set the glass aside and repeat as necessary. 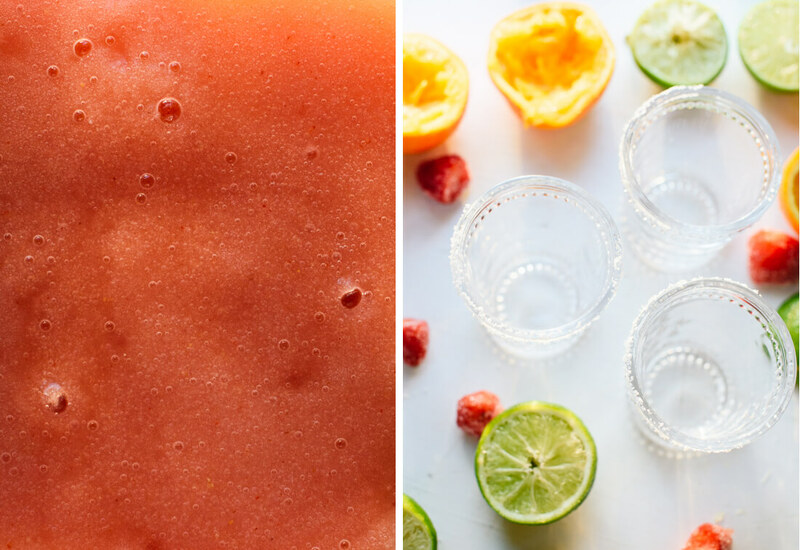 In a blender, combine the tequila, lime juice, orange juice, agave nectar or simple syrup, strawberries and ice cubes. Blend until smooth. Taste and add more a bit more agave nectar if the mixture tastes harsh or just doesn’t quite sing, then blend again. Pour the mixture into your prepared glasses. Feel free to add a few ice cubes to your glasses to keep your drink cold. Serve immediately! Recipe adapted from my frozen blueberry margaritas and skinny margarita recipe. *Tequila recommendations: You definitely want a 100% agave tequila, to avoid any unnecessary additives (also, 100% agave tequila is gluten free, whereas others may not be). My favorite brands are Espolón and Milagro. 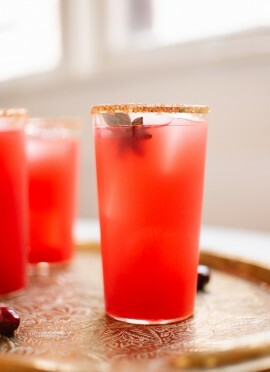 More strawberry cocktails: Don’t miss my Strawberry-Infused Mint Julep and Strawberry Smash! Strawberry margaritas are my favorite! Yum!! 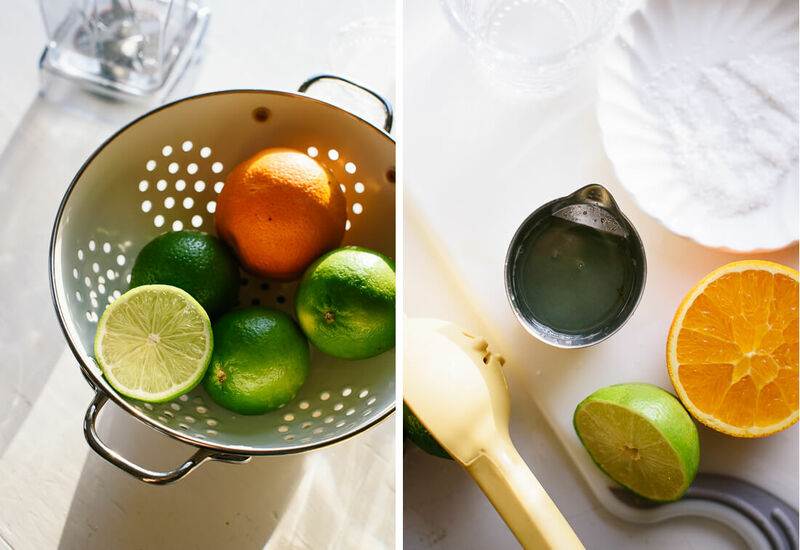 Oooh, this post popped up in my email and now I wish I had some tequila at home! From a creators POV I can definitely understand the worries over changing light, however as a reader all I can say is that the photos are beautiful! We’re having a fiesta this weekend, and I can almost guarantee you that these will be making an appearance! These sound incredible! Hope you love them, Robin! Hi Jerilyn, I bought the glasses recently at Crate and Barrel. They’re on the small side (they actually couldn’t quite contain a full margarita), but they’re very pretty! 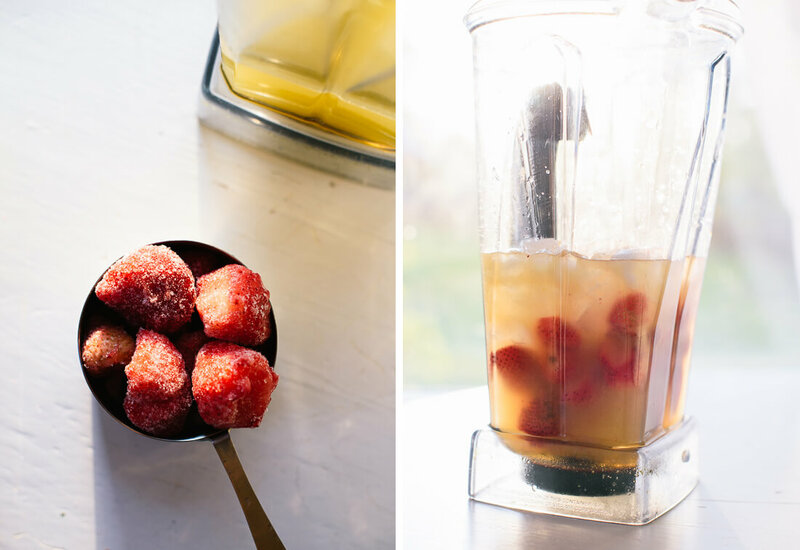 A frozen drink is such a great way to commemorate spring! I think frozen mangos would work well also. I can’t wait to sip these on my porch. Pinned! Oh yeah, mango would be fantastic! These look so fresh and light. I love the addition of fresh orange juice. Tonight’s treat maybe? Ahaha tequila is always a mainstay in my pantry too (riiight next to the brown rice and lentils) :D These sound perfect for the warm weekend we’re about to get here! Haha! That is why I like you. :) Hope you’re soaking up that warm weather! These are a spring favorite for me. 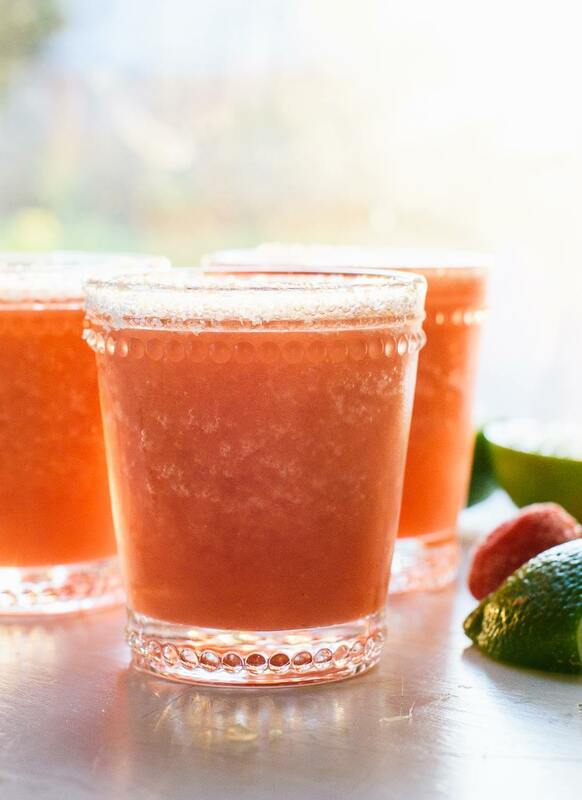 I mean, I haven’t tried this recipe version yet but I love strawberry margaritas in the spring. We made these last night for my boyfriend’s 21st birthday along with your mango salsa, and they were a huge hit!! Thank you so much for such an awesome recipe! Ms. Taylor, these look delicious! I am wondering, however, if you could please share the name of your glassware?? I love it! Woops! Found the info in a previous comment answer! Thank you! Deb, diddo on the glassware! Mmm, I love a good margarita. This would taste great with some tacos. I have been looking for a refreshing cocktail! Merci Kate! Yesssss I love strawberry margaritas! So glad to hear that you took a break to enjoy the weather with this drink. When the first warm days of the season pop up, that’s exactly what I feel like doing: hanging out with a good beverage (preferably made with tequila). We haves to have a margarita party… with our animals. Haves to. This looks amazing! Do you remember where you bought your colander from? I love it!! Thank you!